Irvinebank, a rural village and former mining and tin-smelting town, is 80 km south-west of Cairns. In 1880 the Great Northern tin discovery was made at Herberton, 25 km east of Irvinebank. Two years later three prospectors, James Gibb, Andrew Thompson and James McDonald, found promising tin lodes in the catchment of the Gibbs and McDonald Creeks, in the vicinity of the future Irvinebank. The Glen Smelting Company in Herberton, managed by John Moffat, acquired several of the tin shows in Gibbs Creek in 1883. Moffat, an experienced and cautious entrepreneur, identified Gibbs Creek as a good location to centralise his operations. It had a drier climate west of the Divide, a good supply of water for smelting operations and the prospect of vertical integration - control of both ore supplies and smelting. 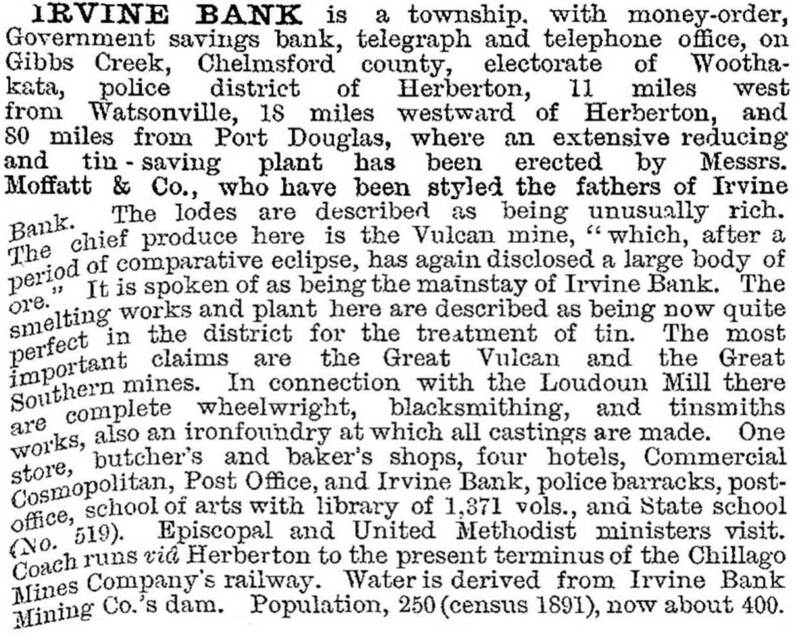 In 1883-84 Glen Smelting opened a battery and smelters at Gibbs Creek, renaming it Irvinebank. John Moffat was born in a small village on the Irvine River in Ayrshire, Scotland, and he built Loudoun House (his residence) and the Loudoun Mill, both named in memory of Loudoun Parish, Ayrshire. A fairly complete little town emerged in a couple of years: Tait's Hotel, a general store, a draper, a butcher, a baker, a primary school (1886), a school of arts and Catholic and Methodist churches. Moffat's house overlooked a large timber-walled weir across Gibbs Creek. Moffat gained a benevolent ascendency over the Irvinebank community by willingly taking privately mined ore for his Loudoun mill, encouraging efficient and uninterrupted production by promptly paying his suppliers. A member of the New (Swedenborgian) Church, Moffat's religious convictions obliged him to treat his neighbours well, a rarity among mining entrepreneurs. Moffat also owned the Stannery Hills mine, 15 km north of Irvinebank, and acquired a controlling interest in the immensely rich Vulcan mine discovered in 1888 at Irvinebank. In 1902 a tramway was built from Stannery Hills to the Mareeba-Chillagoe railway line, and in 1907 the tramway was extended to Irvinebank. The extension was costly, and put a strain on Moffat's finances, coinciding with a fall in metal prices. The Irvinebank mining industry underwent retrenchments after Moffat's retirement in 1912. In 1919 the battery, smelter and tramway were sold to the Queensland Government as a State enterprise. At the peak of Irvinebank's prosperity it had two brass bands, a busy social centre in the school of arts/public hall (1901), a large primary school and a well fitted out hospital. Ivinebank was the administrative centre of Walsh Shire from about 1902 until the shire was absorbed by Mareeba Shire in 1932. The local doctor had an astronomical observatory and a skating rink under his house. His death from influenza in 1919 symbolised the coming of decline of Irvinebank throughout the next two decades. The tramline was closed in 1936 and the lines pulled up for reuse in 1941. Much of the township and industrial areas are heritage-listed, although privately owned. In 2004 an owner removed artefacts and architectural fittings, but police action secured their return. Irvinebank has a tavern/motel, a primary school and the Loudoun House museum. The former State treatment works, former Queensland National Bank building and the Vulcan tin mine, 1.5 km west of Irvinebank, are on the Australian heritage register. The School of Arts and Loudoun House are on the Queensland heritage register. The annual John Moffat festival was revived in 2005, coinciding with the opening of the John Moffat gardens on Gibbs Creek.